One of the biggest necessities in any apartment also happens to be one of the biggest space consumers. Your bed — be it a twin, a queen or a king, etc. — naturally takes up quite a bit of room that could otherwise be put to better use. Now, when most people think of bedding substitutes, cheap, unattractive options (like camping cots) tend to come to mind. Fortunately, it doesn’t have to be this way. 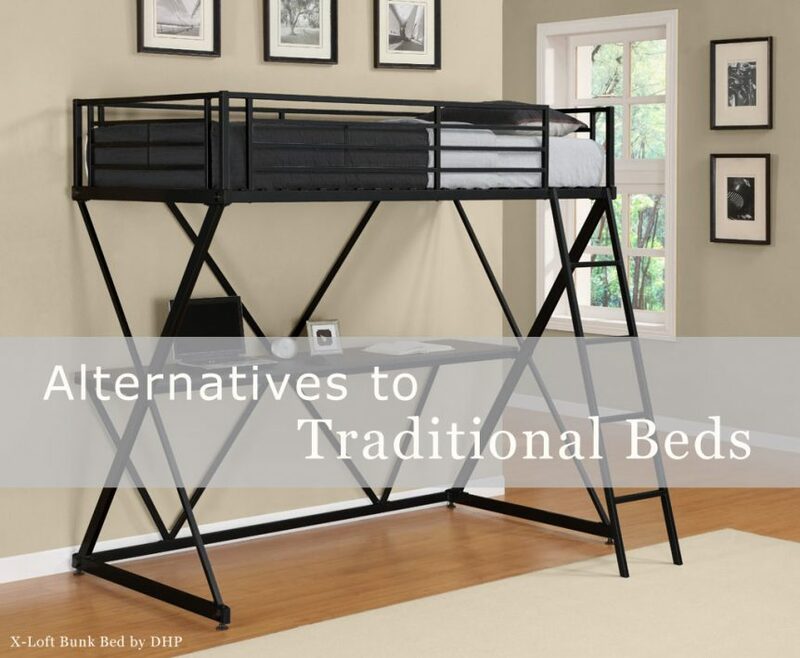 There are actually many alternatives to traditional beds that not only help you save space, but also can complement your apartment’s style. Yes, this is the type of bed that folds down from a wall or large cabinet, but pay no attention to the stereotype that they are for dingy little apartments owned by lonely private eyes (you can thank 1988’s Who Framed Roger Rabbit? for that). Modern Murphy beds can be very elegant and classy. Furthermore, they don’t have to cost a fortune. If you have the time and some basic tools, you can build your own for under $200. You can also check out discount furniture suppliers for deals. Basically a bunk bed without the bottom bunk, loft beds are another great way to save space. While most loft beds stand on posts, you can also go with one that has a frame secured against the wall and is further supported by rope connected to the ceiling or further up the wall. If you’re building it yourself though, just be careful to make sure that the bed is completely secure. Of course, many furniture stores supply loft beds and frames. You can get a decent one for between $150 and $300, often less if there’s a sale going on. This seems like an obvious solution, but it’s still one of the best (rather than grimacing at Charlie Kelly’s sleeping arrangement on It’s Always Sunny in Philadelphia, watch old Mary Tyler Moore episodes and check out her stylish pullout bed). With this, you kill two birds with one stone by having a place to sit and hang out in addition to a full bed. Now, futons actually tend to be more comfortable, but that’s not to say that you can’t find comfy pullout couch options. When shopping for a futon / pullout couch, be sure to ask about compact options to make it even more of a space saver. Don’t like the idea of a pullout couch? Consider a day bed instead. You can use it for lounging around and hanging out during the day, then sleep comfortably at night. Some models even come with drawers underneath for extra storage space. There are quite a few different kinds of day beds, and they are on the popular side, so there are plenty of options to choose from. This type of bed pulls out from a platform or the bottom of a large dresser (rather than a traditional trundle bed, which pulls out from another bed). If you’re able to construct a platform, it is far more worth it because you then can use the top as extra floor space. However, dresser “trundle beds” work well too because they allow for extra storage. The main issue with these beds, however, is not necessarily the cost, but the difficulty of finding furniture suppliers that stock them. If you’re handy though or know someone who is, there are plenty of DIY options that can be found online. This is a type of cushy yet relatively thin mattress than can be rolled up, much like a sleeping bag. It’s not the classiest form of bedding, but it certainly does save space, and you can get one for as cheap as $30. Most are no larger than a single or twin size bed, but it’s not impossible to find a larger one. This is by far one of the cheapest options. And if you don’t mind having a really unconventional sleeping arrangement, a hammock for a bed may also be one of the best selections if you’re trying to save space. Take it down whenever you want when you need that extra room. Remember that no matter what option you choose, your top priority should be comfort. You can always save the most space by just throwing a sleeping bag on the floor every night (and if you want to do this, more power to you! ), but this is not likely to result in very restful sleep. No matter how small it is, your apartment is your home, and you should have a bed you are happy with.